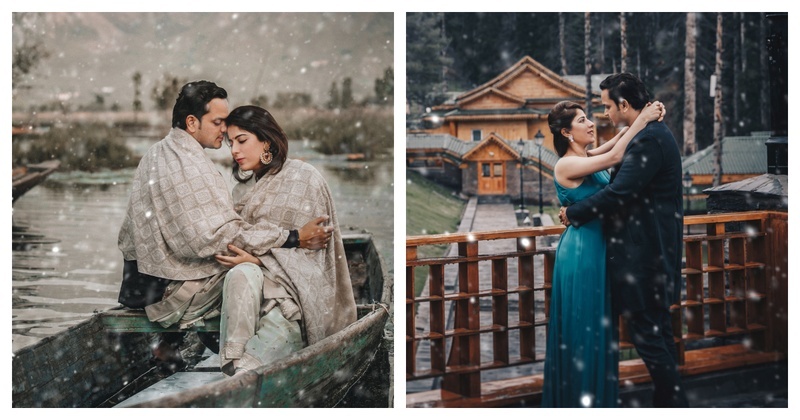 This couple decided to do their pre-wedding shoot in Kashmir and it's purely magical. - Jahangir, Mughal Emperor, when he visited Kashmir. Kashmir - the land of beauty, romance, perfect scenic backdrops and bone chilling temperatures is undoubtedly one of the most preferred locations for pre-wedding shoots. And when it’s captured by one of the best photographers of the country - Shades Photography, it’s definitely magical. Why did you decide to shoot in Kashmir? What was the inspiration to shoot in the shikhara? “Working with Shades was like working with family. We share a very close bond with them and they have known us for a long time and in a way been a part of our journey. So, they were always our first choice.